Always feel secure in the knowledge that under RRS Rule 12 the overtaking boat keeps clear! 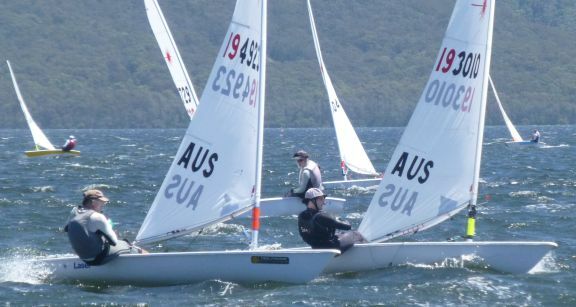 The State Masters run at Port Stephens Sailing and Aquatic Club saw conditions which tested sailors and officials alike. There were just over 100 entries (49 Radial 46 Standard and 7 4.7′s). The PSSAC did a great job in running the event both on and off the water. The only hitch was when a Radial sailor here after to be named Sparky dragged his dolly mounted Laser under the power line causing a power outage which left the Standard Rig sailors to shower in the dark with cold water – serves them right for having so many general recalls. There were good SE and SW breezes over the weekend and lots of dense rain clouds and – suprise suprize – quite a bit of rain. Saturday saw Race Officer Andrew McLachlan delay the starts and send the fleets back home to allow the wind to settle. This was a good call because after an hour or so the wind stabilised and gave good fair conditions until the final stages of last race of the day. With all the delays racing concluded at around 6.00pm. After the long day on the water 90 sailors and friends joined a dinner at the Ibis Resort. At the dinner shirts were presented to those Masters who later this month will be travelling to Oman for the World Masters. There are 26 entered in the Worlds from NSW/ACT out of 33 Australian entries in this event. On Sunday there was a useful breeze circa 10 to 18 knots and the 4.7′s and Radials were started right on schedule. From then on the schedule was shot with the need to change the course and line several times as the wind swung. The Standard Rig fleet caused several airings of the black flag. This became contageous and the Radials had a few general recalls again resulting in the black flag being hoisted. In the event all six races were completed in each fleet with the final Standard Rig race started not far inside the 15.30 time limit – so both days were long ones on the water. The results are under the Results tab on the site and are linked in the list below. If you are interested the fleet results are here. Note that the event is not scored by fleet and naturally places within the age divisions can (for better or worse) be different in the fleet to the official results. At the conclusion of racing at the Coast Championship last Saturday Mitch Buckingham from NB SailSports took the opportunity to try out the Laser foils using what is proving to be the most desirable rig for foiling the 4.7. As expected there is a learning curve both for the set-up of the foils and how best to get airborne in a Laser. You can see in the photo that Mitch did manage the feat. 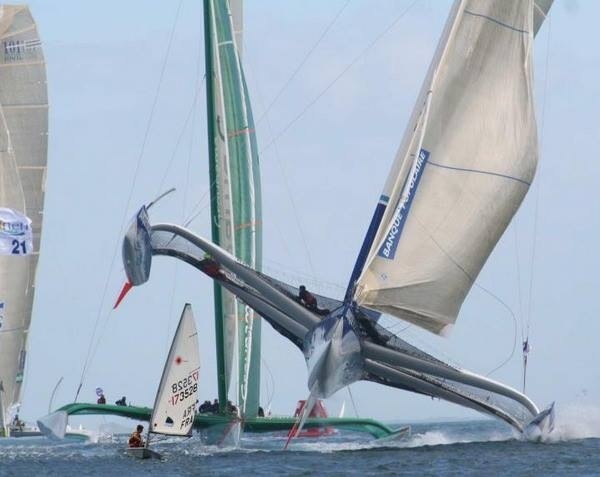 For more information on the foiler kit check the Glidefree site here. Shane Conoly MHASC leads Nick Conner RPAYC as he did through the Radial Series. The Coasts at South Lakes were blown out on the Sunday with the series being scored on the three races sailed on on Saturday 12th October with no drop. Safe competitive racing was not possible on Sunday due to over 25 knot NW winds combined with very large and potentially boat breaking waves on the course. Saturday on the other hand was picture perfect with a 15 knot ENE breeze for the three heats. There were 47 entries for the series. The on water SLMASC team and our PRO Col Chidgey set a very nice course which stayed the same for the three races. The 4.7 series had six boats and was won by South Lakes local Scott Singleton-Turner with two bullets and a second to edge out fast improving Gosford sailor Jordan Makin (3,1,3) with Peter Charlton also from South Lakes third. 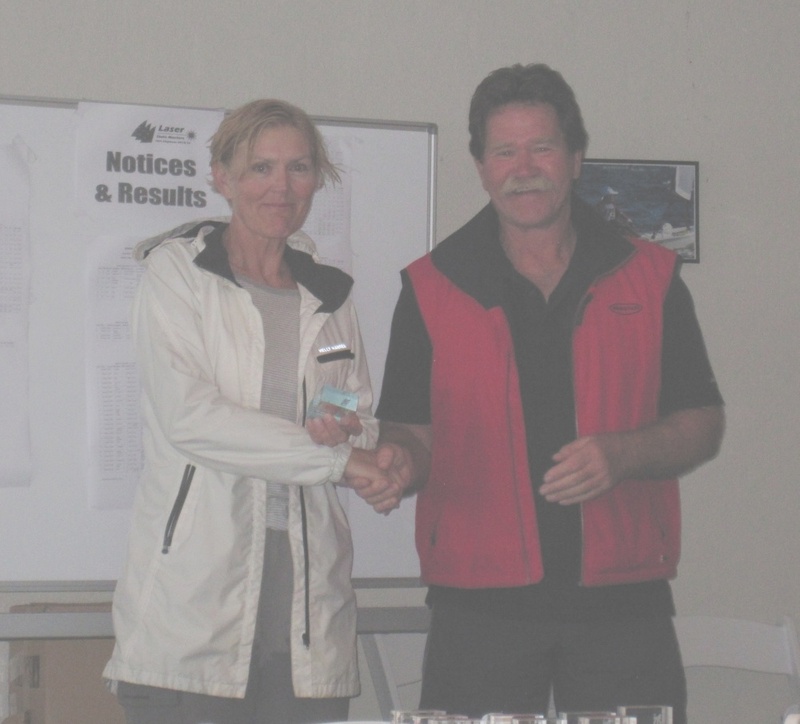 The Radials had 24 competitors and were headed by Shane Conoly from Middle Harbour Amateur Sailing Club. Shane finished with two bullets and a second. Second was Nick Connor from RPAYC (5,1,2) and third Stuart Penderleith also MHASC (2,3,6). The Standards were won convincingly by Sean Atherton from MHASC with three straight heat wins. Chris Dawson from RPAYC was second (3,2,2) and Richard Howard from Belmont 16′s third (2,3,5). Thanks go to the great team at South Lakes for their organisation both on and off the water. It is a great dingy sailing club in a fabulous location. You can see the full results and photos on the Results and Photos tabs above or click the links below. The annual Laser Masters Golf Tournament will be held on Friday 15 November at Nelson Bay Golf Club (Dowling Street , Nelson Bay). 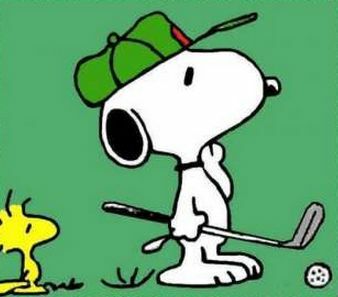 We need plenty of players again this year – fun is more important than golfing ability as it will be the usual Ambrose format to cater for all skill levels! 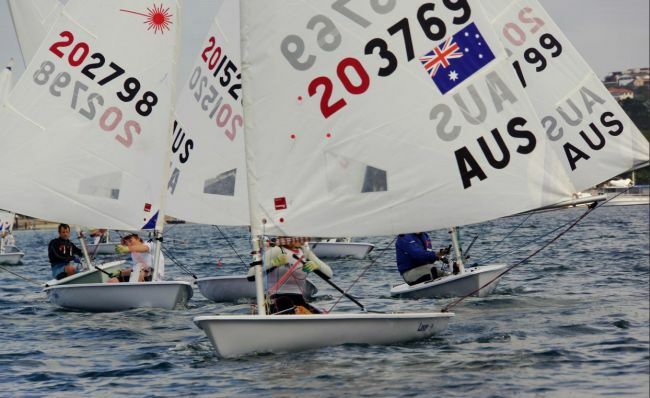 The State Masters is coming up on 16 and 17th November at Port Stephens Sailing and Aquatic Club. The Notice of Race is here. While we may not get the giant NE’er we had last year at Great Lakes (pictured above) Port Stephens is always a choice venue offering fair winds and good clear water sailing in a great location. There is lots of accommodation available in the area. Check out Port Stephens Accommodation, the Port Stephens Visitors Centre or just Google it. IBIS Salamander Shores Resort, right at the club, is offering special deals for bookings – check them out for online rates here or ring 02 4982 7210 and mention the Laser Masters Regatta. There will be a Gourmet BBQ at the Salamander Shores on the Saturday night. The cost is $30 with tickets available at registration. The first regatta of the season the Coasts is coming up on 12 and 13th October at South Lakes Sailing Club. This venue at Sunshine on Lake Macquarie is a fabulous sailing venue. You can see the Notice of Race here and the Sailing Instructions here. You can enter the regatta on line at the Enter of Join tab on the site or just click here. Beach entries will be accepted up to 11.30am on Saturday 12th October. There will be a free sausage sizzle after racing on Saturday and the NSW/ACT Laser Association Annual Meeting will be held also after racing at 6.00pm on Saturday. The Agenda for the AGM is here. 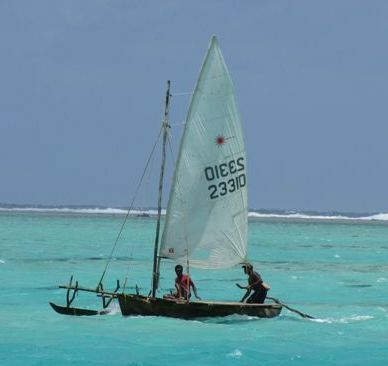 Inspired by the Americas Cup AC72′s in SanFrancisco left is a sneak photo taken recently at Mystery Island Vanuatu of trials of the latest Laser development. Laser sailors are invited to the Big River Sailing Club Single Hander Regatta Oct 26/27 on the lower reaches of the Clarence River. Cut loose for damn good time, leave the city lights and come sailing among the cane fields. 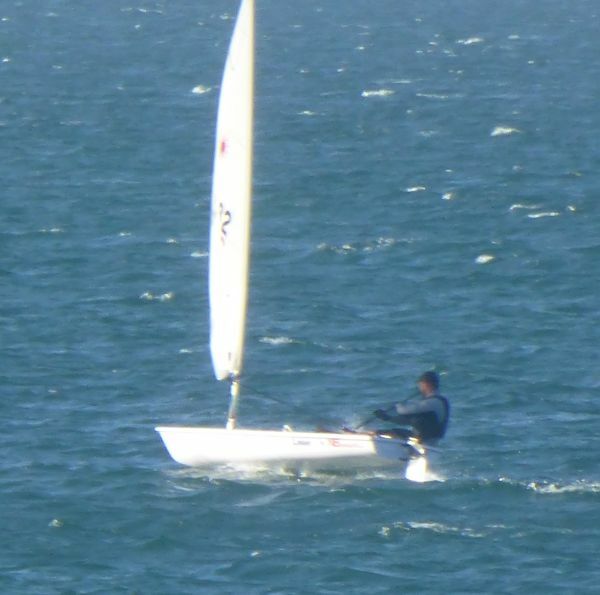 Balmoral Sailing Club has started a small Laser fleet for the 2013-14 sailing season. Balmoral Sailing Club offers well established club premises, a well run racing program each Saturday, spacious rigging area, safe and easy launching and retrieval from a sheltered sandy beach. New members are welcome and boat storage is currently available. Balmoral Class Captain and long time Balmoral sailor Graham Hanna has a brief to grow class numbers over coming years and welcomes new and established Laser sailors to come along and try out all that the club has to offer. Balmoral Sailing Club is located at the south eastern end of Balmoral Beach, The Esplanade, Mosman. Club website is www.balmoralsc.com.au. 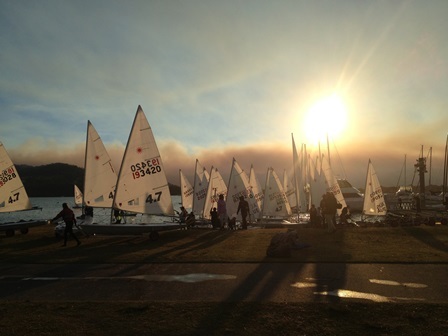 Double Bay Sailing Club hosted the final leg of the NB SailSports Sprint Series on Sunday 8 September in conjunction with the club’s annual regatta. 69 sailors entered on Sunday. The day’s results are here and the overall series results are here. 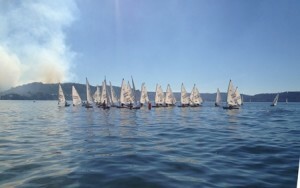 The DBSC regatta results and some photos can be viewed on the DBSC web-site. Blake Selley continued his excellent form in the 4.7s winning the day and the overall series. Alex South was first for the day in the radial fleet, with Shane Conly first overall. In the standard fleet, Mark Bethwaite was first for the day, with Sean Atherton taking out the series. Rob McMillan from NB SailSports who very generously sponsored the series presented the placegetters with their prizes and drew the overall prizes. Our so-called Sydney winter is nearly over …. and what better way to start your DBSC Spring Season than with a 2 day Regatta on 7-8 September? This is the biggest regatta that DBSC has hosted in many a year and the sailing committee is hopeful that Laser skippers will turn out on both days to ensure a large fleet and help contribute to a weekend of competitive and enjoyable racing DBSC style. DBSC is using this event to test their ability to host larger association events on Sydney Harbour, so please come along and help test them. The first leg of the inaugural DBSC – Vaucluse Interclub Championship on the Saturday, competing for the Dean Bergman and the Graham Reed trophies. Click to Enter. Please enter as soon as possible as this will assist DBSC plan and cater for everyone. The NB SailSports series notice of race and details of prizes can be found on the laser association’s events page. The third round of the NB Sailsports Sprint Series was sailed out of Gosford Sailing Club on Sunday 25th August with 49 boats entering. The first race set in a very shifty light westerly made it challenging for all the sailors. The forecast light SSE came in by the start of the second race providing pleasant racing conditions. Winners on the day were Blake Selley in the 4.7 s, with three wins, Shane Conly in the Radials with a 1, 2, 2 and Sean Atherton in the Standards with three wins. You can see the results for the day here and for the series to date here. Please contact the Membership Secretary (see contacts page) for any queries regarding the results. Thanks to Gosford Sailing Club for the event organisation and great bacon and egg rolls. The next leg of the Sailsports Sprint Series is at Double Bay Sailing Club on Sunday 8th September with the first race start at 11.00 am. 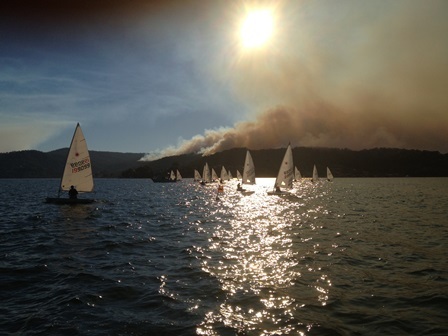 Some photos of the day show the log-jam at the bottom mark in the first race, backdrop of smoke from hazard reduction burn during sailing and coming ashore. 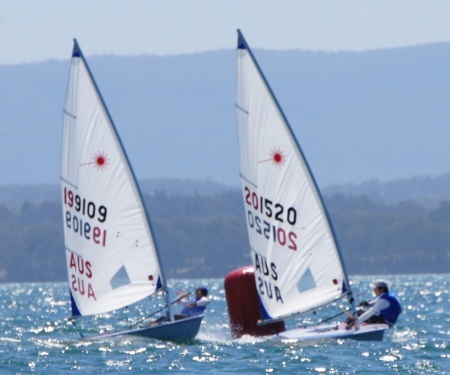 The next round of the NB Sailsports Winter Sprint Series is on at Gosford Sailing Club on Sunday 25th August. As for each of the four rounds there will be three races. The warning signal for the first race will be at 1.00pm. 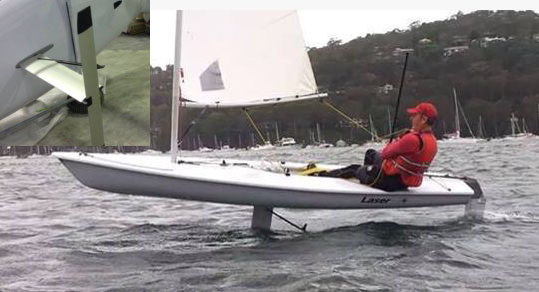 Sailing Anarchy is carrying news on PSA’s Chris Caldecott’s post on his experience with a new foil fitted Laser centreboard and rudder. There is discussion on the subject as well as a brief comment by Chris on his experience with the foiler Laser over the weekend. You can see the posts here. Chris suggests that he hit 20 knots. This may not be up to the 30 knots which Moths routinely achieve, or the 40 knots of the AC72′s, but fast for less money may be in prospect. The photo of the unit in action features our very own Peter Stephinson at the helm. You can see a video of the action here. To see more about the Laser foiler kit visit the Glidefree site here.